Does my prop move as I look around? No. Your prop only rotates / leans on your screen. It will stay the same in the same position to other players on the server regardless of how you position it on your screen. If you’re in doubt ask your teammates to check how your prop looks in the game.. Warning: When you are looking around your name may become visible to people looking at you so this can give you away. I'm unable to change into a prop. This is a very broad problem that could be a number of things. The most common causes are below. Some props could be banned such as money (it’s usually banned by default) you are usually notified of this by a chat message as you try to change. Your action key is not E check this in your settings. What your trying to become may not actually be a prop on the server. Make sure what you try to become can be moved and is not just part of the maps scenery. You are unable to become a prop you already are and you will just pick it up. E.g. You cannot change from one cup to another you will just pick the other cup up. Ensure you are not pressing crouch (Usually Ctrl) as you press E. Pressing crouch will make you pick the prop up rather than change. Disable all other addons / plugins in your Garry’s Mod. 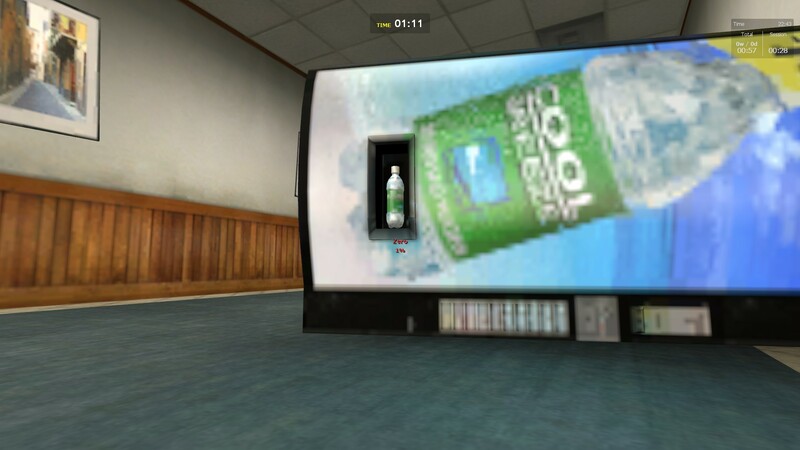 This can be performed from the Addons menu at the home screen in Garry’s Mod. Remember to not disable the PropHunt mode. I'm stuck as unassigned or spectator teams. Press your F2 key to bring up the team menu. This is also available from the F1 key as well. As a prop how can I pick up other props? Press and hold CTRL before pressing E. For this to work you have to be very close to the prop you want to pick up. If the prop is the same as what you are just press E and you will pick it up. How do I jump high? You are able to jump higher by pressing and holding crouch then as you let go of crouch hit the jump key to perform a high jump this is the same as all source mods / games. I was killed by Gravity? As a hunter or prop you will take fall damage in prop hunt. Sometimes this fall may be enough to kill you. Double check your health before jumping off something high. This may happen sometimes if you get stuck on another prop or are using a ladder and you glitch out. If this happens there is not much you can do to work around this other than avoid that section of map. I was killed by World Spawn? This is not something you have done. Some maps are not developed with enough spawn points on it so the server will spawn multiple players in the same point. When this happens only the first player on that point will survive, the rest are killed by world spawn. The only ways to resolve this is to reduce the number of players on the server or find a map with more spawn points. How can I open doors? As a player or prop you are able to open doors with your interact (E) key. 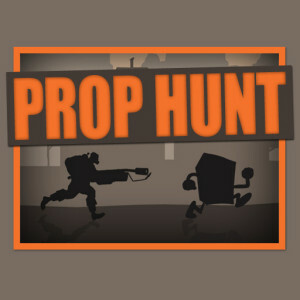 There is no run option by default in prop hunt. All players will generally move the same speed. Playing as a Prop can be fairly challenging. Your goal is to change into an object or Prop on the map and then hide from the other team. You win the round if one Prop is still alive when the time runs out or the hunters all kill themselves. As the goal for the prop team is to hide as a object on the map becoming a prop is important. Use the ‘E’ key when you are close to a prop and the cursor is over it / in its area to transform into the prop. Be careful not to get stuck when changing as you may end up through a wall or another prop. The key thing to note is in prophunt the amount of health you have as a prop is proportional to the size of the prop you are. The bigger you are the easier to find you become but you also have more health. Moving props can be used to your advantage to make an area harder to search or to hide under something else. To pick up a prop without transforming into it press and hold the crouch key (usually ‘Control’ or ‘Ctrl’) then press the ‘E’ key to pick the prop up. There are a few things to note with this one being that you must be directly over a prop to pick it up as there must be a very short distance between you and the prop to pick it up. Secondly walking while carrying a prop is very difficult as the prop bounces off you slowing you down, the best option is walking backwards or sideways to avoid this. Thirdly if a prop gets caught against the wall or other object in the game and you don’t move it back out you will most likely drop it as you try to move. Taunting is used to mock the hunters but also used to help them find you or lead them elsewhere. Whenever you taunt your prop will play a random taunt from the server that all players can hear. Beware though as there are infinite taunts that will not stop playing until the round is over. To taunt in the game press the ‘F3’ key on a Mac you may need to change your settings to use the f1, f2 keys as standard keys otherwise holding the ‘Option’ or ‘Alt’ button while pressing a function key may work for you. As props come in a variety of different sizes they are able to get into areas that the hunters may not be able to get into or see. On most servers these are known as Glitched spots or Map exploits. When playing as a prop a general rule of thumb is don’t go into areas that require you to go through small gaps like fences where a hunter is not able to get to. A good rule of thumb is to check the rules for the server as some have listed areas that are banned to prevent glitching. Pay attention to your teammates as most people will comment on your position if your in an illegal spot. 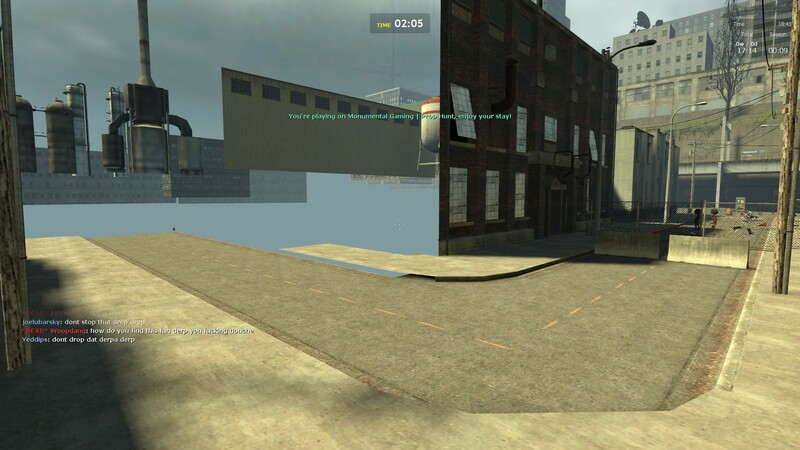 The below map is cs_assault. The prop is the little black can on the left at the end of the road where the map ends. The hunters are able to get as far as the fence on the right. The best way to find new spots is to spectate other players once you have died and see where they are hiding in the map. Information on spectating can be found in the general section under spectator mode. Exploring the map by yourself is also a good way to get to know the map and scout out potential spots. As a prop be very careful of ladders and heights. In some instances you may glitch on the ladder and can be launched on the map and killed. This goes to the same as dropping from heights as you will still take fall damage as a prop and this may kill you if you have low health. Be-aware of other player props around you and try to stay clear of them as running into each other may get you stuck. This may also happen if a hunter walks over you. Playing as a Hunter can be just as challenging if not worse for a hunter. As a hunter your goal is to locate all the Props in the map and kill them. Your team wins if all the Props have been killed before the time runs out. Locating props can be difficult until you learn maps and where things should be. Generally noticing things that are out of place is the best way to find props but for new players checking every corner of rooms and little gaps in walls and such is a good place to start. If you suspect something is a prop you can try and pick it up with a press of the ‘E’ key or walk into the prop as it will move slightly or fall over when not player controlled, however that said good props learn to move when players walk into them. If you glitch or get stuck on an object in the map you may find a prop is around that area. Sometimes you will get stuck on player controlled props. As a hunter you have a set limit of health (usually 100) and this goes down though normal mistakes such as falling but the main thing you need to be aware of is that shooting or hitting non player props with your weapon reduces your health by 5 points (For the SMG this is every round fired) so you can kill yourself quickly if you’re not careful. What weapon you use is entirely up to your personal preference. One thing to remember is the grenade for the SMG (Fired with a right click) is probably best not to be used unless you have encountered a small prop such as a cup or something you can’t hit with a gun. Beware you will take 5 damage for every prop hit within the blast of the grenade. Some maps may also have weapons you can pickup which are able to be used against props in that map. Spectator mode is available if you are in the spectator / unassigned teams and while you are dead. This mode allows you to view other players of your team (This is only team locked when you are a hunter or prop) and follow them or fly around the map as a free spectator. When you are in this mode you can press the ‘spacebar’ to change viewing mode from 3rd person view, first person view and free fly modes. You can also use the mouse left and right clicks to change what player you are spectating. Ghosting is when a spectator or a prop on your team tells the hunters where props are hiding. This practice is generally frowned upon on servers and may get you kicked or banned from a server. Generally the only acceptable use for this is when a prop is using an illegal spot. You are able to switch teams though the menu under the ‘F2’ key the keyboard. this allows you to change to either a prop, hunter or spectator. Most servers switch the teams automatically each round (Hunters switch to props and props to hunters). A general rule of thumb is not to switch teams to avoid playing as a certain role most commonly used to avoid becoming a hunter. This will likely lead to you being kicked or banned from their server. Most servers also have a cooldown on the switching option so you are only able to switch so often. Sometimes you get a map that does not have many props on it or is too big for the number of players on the server. If this does happen you can vote for a map change by pushing the ‘F1’ key and clicking “Vote For Change” this broadcasts a message to all players saying you have voted for a change and the number of players needed for the vote to be successful. This is a list of controls for Garry’s Mod and Prop Hunt. These are the default controls so may vary for you if you have changed your settings. In a Mac system you may have to change your options to use standard Function Keys rather than the hardware functions. This is different for each Mac OS version. Some Servers have additional buttons that perform other actions such as F4 being the common button for a Point Shop. This information is provided as a guideline only as servers may have different rules to what I have assumed here and it is up to you to read and obey the rules of those servers.